The class broke into small groups to work on projects after reading 'Prisoner 88.' This group is turning a scene from the book into a skit. Mr. Chadburn consults with the small groups on their projects. In eighth grade, it's important to take time to be silly! 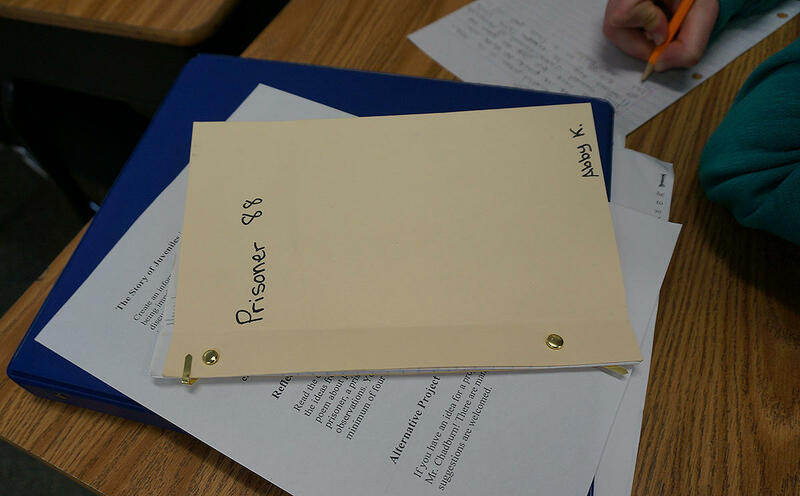 While reading Prisoner 88, the eighth graders in Kyle Chadburn's Humanities class at Brownington Central School researched the practice of jailing juveniles in the United States. They also came up with some probing questions, which Dorothy’s List put to author Leah Pileggi. Abby Karlen: What made you write a story about a juvenile in an adult jail? Pileggi said it all started when she toured an old prison in Boise, Idaho. Leah Pileggi: So I went on a tour and it was a very hot day, but we were touring. And it was a big group of us, and people were leaving, going to their cars to get into the air conditioning. And I’m lucky I stayed because right at the end of the tour the docent, the person who was giving the tour, said, “Well, the youngest prisoner who was ever here was ten-years-old.” And I’d thought, first of all, that I’d misheard him. But then I asked more about it and he said, “Oh yeah, he was ten-years-old but it was back in the 1880s. And I thought, well I want to read that book. But it turns out there wasn’t a book about him. And in fact they didn’t know very much about this kid. So I took it upon myself to do all of the research about this kid. And it turned out to be so fascinating it ... just became the book. Kennedy Falconer: Did the prison tour motivate you to write the book? Leah Pileggi: The prison tour, yes it did motivate me. What it did was it sort of introduced me to a world I had never seen before. And I became so interested in Boise and especially in, sort of, the old west. It’s something that I had never really been immersed in before. And it led me then to the Idaho Historical Society. And they were fabulously helpful in doing all of the research about the prison and about that time in history. 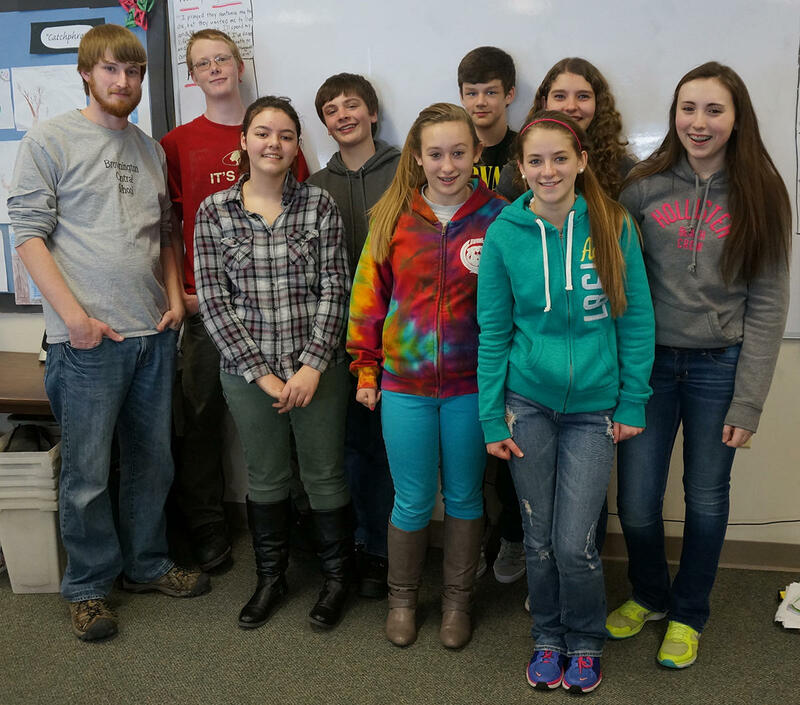 Eighth graders in Kyle Chadburn's Humanities class at Brownington Central School have been reading 'Prisoner 88.' Back row (l to r): Kyle Chadburn, Evan Glodgett, Zachary Barrup, Ryan Martel, Kennedy Falconer, and Alaina Zenonos. Front row: Katie Willard, Autumn Walsh, and Abby Karlen. Ryan Martel: If you were in Jake’s shoes, what would you do? How would you react? Leah Pileggi: Wow, that’s a tough question. I’ve often put myself in the cell that he was in because I sort of had to visualize what it was like to live in such a small space. And I’m claustrophobic so for me, that would just be one of the worst things. But I have to say that being in prison back then, when it was completely self-sustaining, they all had jobs. The prisoners did all the work. It might not have been as bad as it is now, where people tend to have a lot of time to think too much and to do too little. And back then they were much more active; they were gardening, they were taking care of livestock and animals and all. I’m not saying that I would want to be there at all but I think you have to make the best of the situation, no matter how bad it is. Evan Glodgett: How did you decide which events would be necessary in the plot of the novel, like the prison break and the other events. How did you get all those to line up and actually add to the ending of the story? Leah Pileggi: I knew what the ending of the story was going to be, so I knew my beginning and I knew my ending. And I knew that there had to be some really large event. In any good story there’s always some really big event that happens that makes a change in the middle, and it seemed to me to make sense that it would be a prison break or an attempted prison break. And I read everything that I could about what other prisoners had done at that time. The types of things they had done, what they had stolen that they could use to try and get out of there, and I used that information then to write that piece. Katie Willard: Do you think family background plays a role in juveniles committing crimes and incarceration? Is that why Jake’s father is such a big part of the novel? Leah Pileggi: That’s a really deep question Kate, wow. Um, I do think family can have a really big influence on kids, on keeping them from getting into trouble. In the situation with Jake and his father, well I guess it’s kind of sad. In real life the real boy, James, had both parents. But I thought it would make more sense to have him lose just one parent, if that makes any sense. And obviously, his father was not doing a very good job anyway. But I did try to make Jake as upbeat and as positive and as forward looking as possible. Autumn Walsh: Do you know how James handled himself after he got out of prison? Because sometimes people don’t handle themselves very well. Leah Pileggi: That’s a really good question. We did find James, the real boy, through census records mostly. And we found out what his life was like, somewhat. He lived to be into his 70s. He was a laborer most of his life. He did not go to school. My gut feeling tells me that he did not have a really happy life. I’m not sure how much his being in prison at age ten had to do with that. It may have been that he just had a tough life. But he was in touch with a lot of his family as he was older. So it wasn’t as though he was left completely alone. He was married and he did have children when he was older. But I don’t know how much his being in prison did influence his life later on. Alaina Zenonos: Why didn’t Jake go with the Criswells? Do you think this was a happy ending? 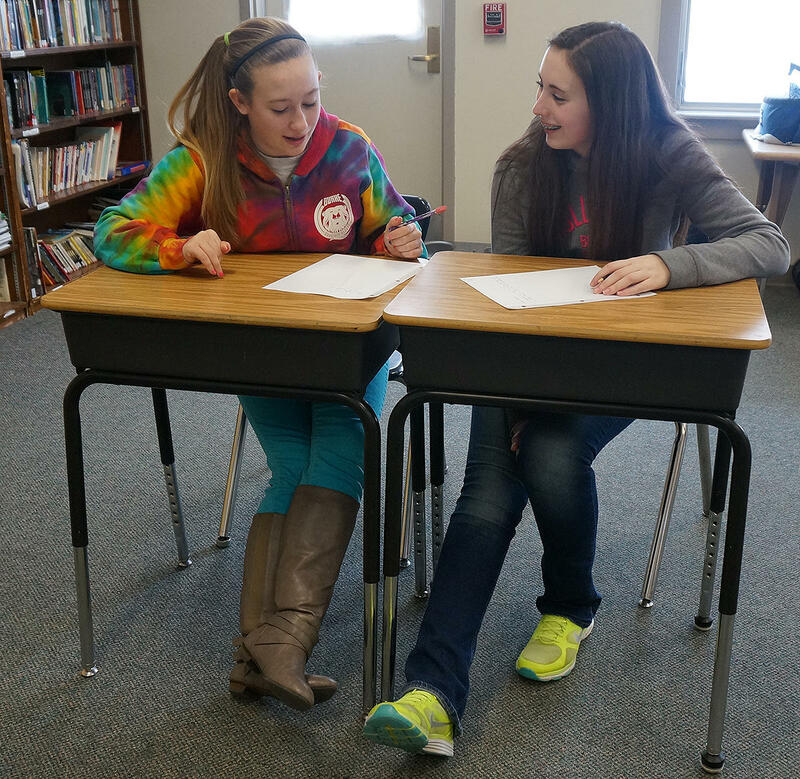 Autumn Walsh and Alaina Zenonos get to work on their project. Leah Pileggi: I think of this as a hopeful ending. I guess you could say that it’s a happy ending, but I look at it as more hopeful because, obviously, Jake has a lot more life to live. A couple things about decisions about making sort of an easy ending: it might have been simpler for him to go with the family, with this family that he knew. Sometimes in literature, and in life, it’s not always the easiest path. So I wanted to give a little bit of a twist and actually, as I was writing it, Jake sort of pulled me along and made me see that maybe there was a different place for him to go, ultimately. Much of Prisoner 88 is about making the best of a tough situation, and that’s evident in the ending as well. The wild west wasn’t an easy place to grow up in the late 1800s, but it makes an interesting history lesson for today’s eighth graders.